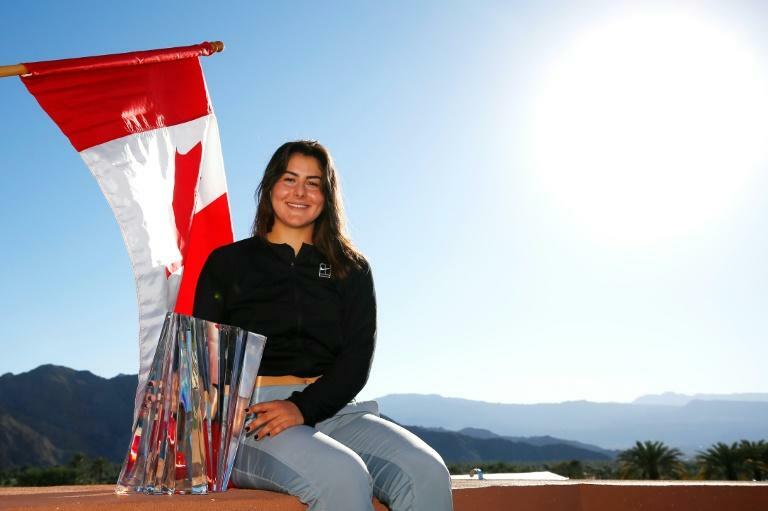 Bianca Andreescu's vision became reality in the California desert, where the Canadian 18-year-old's Cinderella run to a first WTA title put her among the elite of women's tennis. "Crazy," Andreescu herself called it, after gritty 6-4, 3-6, 6-4 victory over three-time Grand Slam champion Angelique Kerber made her the first wild card to win the prestigious Indian Wells WTA title. "Bianca Andreescu just made history. Congratulations," Canadian Prime Minister Justin Trudeau tweeted shortly after the landmark triumph. Andreescu is the tournament's youngest winner since Serena Williams in 1999 and just the fourth unseeded player to lift the trophy after Williams, a returning Kim Clijsters in 2005 and Japan's Naomi Osaka last year. Reminded that Osaka's breakthrough 2018 win was swiftly followed by two Grand Slam titles and a rise to No. 1 in the world, Andreescu was asked if she found that inspirational. "No pressure," she said with a smile. "It's totally fine," she said of the comparison. "It's definitely an inspiration seeing her claim the trophy last year and winning Grand Slams right after that has been amazing to see. But I don't really want to focus on the future right now. I just want to enjoy this moment because I don't want to take anything for granted. "You never know what the next week brings," added Andreescu, who now heads to Florida for the Miami Open this week, where she will be unseeded. Kerber, a former world number one who had slipped to eighth in the rankings as she searched for a first title since she won Wimbledon last year, was up a break in the third set when Andreescu powered through fatigue and cramping to seize the victory. It's the kind of triumph Andreescu has pictured before, in her daily practice of creative visualization which she uses to maintain her calm and focus. But when the moment arrived for real, she said, it was "surreal". "I've watched all these players play on TV so many times, so it's surreal to be able to play against them in front of amazing crowds at such prestigious tournaments." Noting that in March of 2018 she was competing in a lower-level International Tennis Federation 25K event in Japan, "struggling a lot with my tennis and with my body. "It's crazy, what a year can do," she said.